The documentation of city changes and domestic life has always fascinated artists from many generations. In recent decades, artistic focus has shifted to the ramifications of climate change, localism, gentrification, relocation and globalization. “By presenting these very different projects in one exhibition, we hope to highlight two important aspects of the artistic engagement. Firstly, we wish to frame the current discourse on the topic within its historical context and begin to delineate a social change for this process. Secondly, we wish to formulate the practice of a collaborative point of view from different artists. As in other struggles for reclaiming spaces that belong to the public, the strategy of cooperation reveals itself as fundamental. 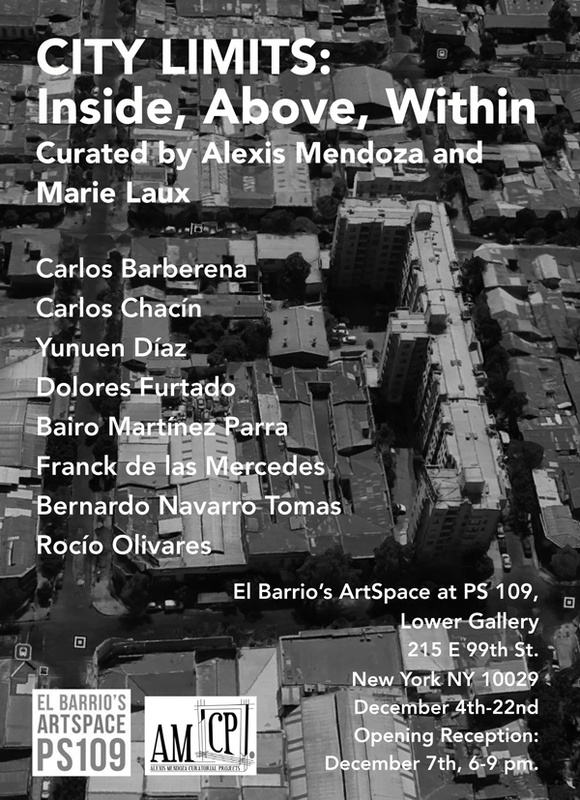 Hence, all the exhibited artworks both contribute to the re-appropriation of the view from inside, from above and from within and explore new modes of cooperation, sharing, and exchange,” curator Alexis Mendoza said. City Limits explores urban representations from cities such as: Medellin, Havana, New York, Chicago, Santiago de Chile, Paris, Mexico City, Managua and Buenos Aires. The exhibit encourages audiences to think about urbanism in a larger context and coincides with collective efforts to enliven and transform our way of living. Works by artists from a variety of disciplines who have lived in different Latin American cities and currently live in cities in Europe, North and South America, explore the new visual strategies generated by the view of a city from inside, above and from within. The exhibit features paintings by internationally recognized Nicaraguan artist Franck de las Mercedes, an artist living and working in Washington Heights, New York City. His multifaceted body of work includes painting, collage, drawing, photography and writing. 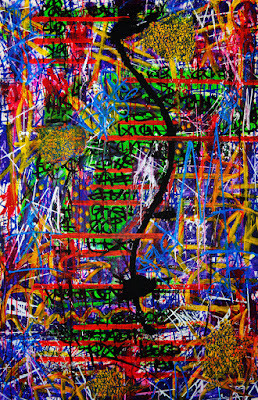 His paintings combine abstract figuration, journal entry, and hieroglyphic-like text, in energetic abstractions bursting with color. “Exploring New York City, Franck de las Mercedes finds influence from looking at the walls, the broken street signs, the graffiti. It’s a visual constellation that we have here and it’s our own accidental stage. A strict adherence to observable fact suggests that de las Mercedes falls altogether outside the boundaries of modernist art, yet his brushwork and technique relate his art to many of the most advanced aspects of contemporary painting. Despite its seeming naturalness, his work owes as much to artifice as it does to nature - to the past, if you will, as much as to the present, a central tenet of post-modernist doctrine. His genius manifests itself in the variegated richness of his spontaneous yet controlled brushwork, the subtle refinements of his palette, the remarkable acuity of his visual memory, and, most importantly, a resolute refusal to align himself with any particular fashion in art or type of commission, however advantageous that might be to his well-being or fortuna critica,” Mendoza said.